MTR100 '13 Aquatec Group Ltd.
Aquatec are designers of standard and custom instruments for the ocean science and offshore energy sectors, including acoustic and optical products. 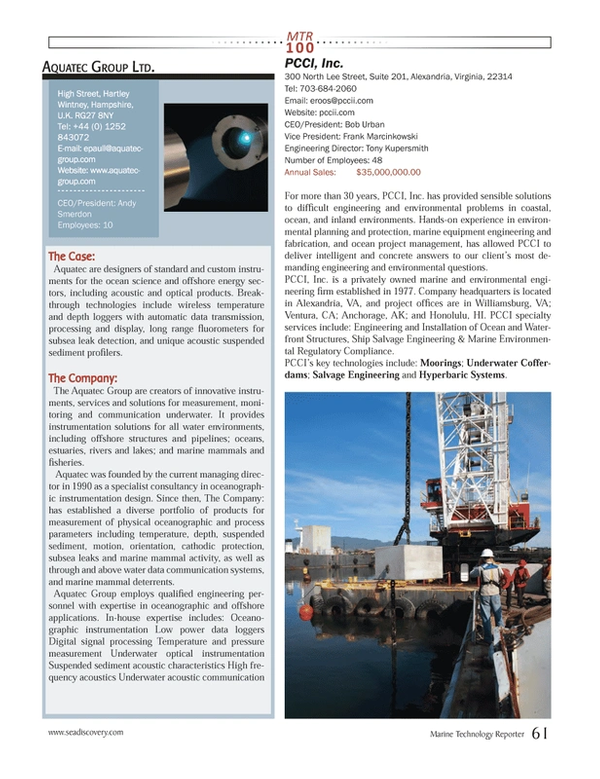 Breakthrough technologies include wireless temperature and depth loggers with automatic data transmission, processing and display, long range fluorometers for subsea leak detection, and unique acoustic suspended sediment profilers. The Aquatec Group are creators of innovative instruments, services and solutions for measurement, monitoring and communication underwater. It provides instrumentation solutions for all water environments, including offshore structures and pipelines; oceans, estuaries, rivers and lakes; and marine mammals and fisheries. Aquatec was founded by the current managing director in 1990 as a specialist consultancy in oceanographic instrumentation design. Since then, The Company: has established a diverse portfolio of products for measurement of physical oceanographic and process parameters including temperature, depth, suspended sediment, motion, orientation, cathodic protection, subsea leaks and marine mammal activity, as well as through and above water data communication systems, and marine mammal deterrents.